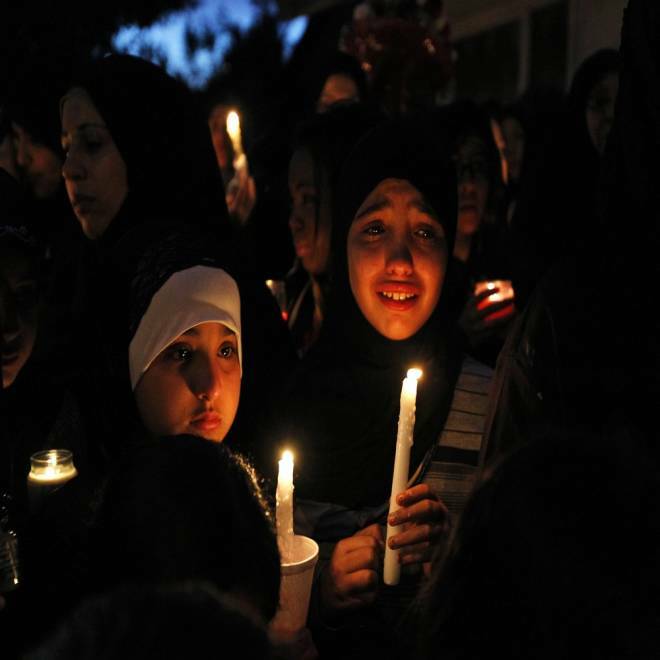 Mourners hold a candlelight vigil to remember Shaima Alawadi outside her home in El Cajon, Calif., on Wednesday. The beating death of Iraqi-American Shaima Alawadi in a refugee community in a San Diego suburb has brought attention to bias crimes against Muslims, even as police caution against definitively labeling her death a hate crime. Alawadi, a 32-year-old stay-at-home mother of five, was found beaten in the dining room of her rented home last week by her 17-year-old daughter, police said. She died March 24. Police are investigating the killing as a possible hate crime because of a note found next to Alawadi's unconscious body that threatened the family. An FBI bias crimes squad is assisting. On Saturday, she was buried in Iraq, in the Valley of Peace cemetery in the holy Shiite city of Najaf, about 100 miles south of Baghdad. "The martyr (Alawadi) used to love all; she made no distinction between religions," Alawadi's father, Nabil, told Reuters. "Her husband told me that someone threw a note saying, 'go back to your own country, you're a terrorist' ... Who is the real terrorist, Shaima, or them," he said. There was a big jump in hate crimes against Muslims after the September 11, 2001 attacks carried out by al-Qaida, but the number subsided during the middle of the decade. But in 2011, the number of anti-Muslim hate groups tripled to 30, according to a recent report by the Southern Poverty Law Center, which advocates for civil rights. There were 186 separate bias crimes in 2010, the highest number in five years, FBI data show. "We are considering the hate crime aspect, but we are not labeling it as such," El Cajon Police Lt. Mark Coit said. But he said he could not reveal any details on the status of the case. In a sign of how closely the case was being watched, the U.S. State Department expressed condolences for Alawadi's death, and Iraqi government representatives attended the funeral. Law enforcement, and Arab and Muslim lobby groups, and even Alawadi's family is uncertain of what happened. "The majority of the family believes that it could be anything," said Nazanin Wahid, a friend who is serving as a spokeswoman for the family. "But the fact that they found a note and that the police said initially that it resonates like a hate crime led them to believe that it could be that." Since Alawadi's death, at least two members of El Cajon's Muslim community have reported receiving threatening phone calls, said Sadaf Hane, civil rights director of the San Diego chapter of the Council on American-Islamic Relations. The Arab community in particular is prone to under-reporting such discrimination because of a distrust of the abuses of authorities, Hane added. California police are investigating a brutal attack that left 32-year-old Shaima Alawadi dead. KNSD's Chris Chan reports. El Cajon is in eastern San Diego County, which is home to the second-largest Iraqi community in the United States, behind Detroit. More than half of El Cajon's 100,000 residents are of Middle Eastern descent. Like Alawadi's family, some of the city's Arab residents are Shiite refugees from Iraq who arrived in the United States in the 1980s and 1990s after fleeing their homeland after Saddam Hussein's 1980 invasion of Shiite neighbor Iran and the long war that followed. But the town has seen an even larger surge of Iraqi newcomers since 2008 through a U.S.-funded refugee resettlement program, often joining relatives in the area, said Michael McKay, Deputy Director of Refugee Services at the Catholic Charities Diocese of San Diego. A friend of Alawadi's family, Sura Alzaidy, told the San Diego Union Tribune newspaper the note found near Alawadi read: "Go back to your own country. You're a terrorist." Alawadi and her husband arrived in the United States in 1993 after spending years in a refugee tent camp. Majed al Hasan was their neighbor there and later became their neighbor in El Cajon. The Iraq they fled was terrifying, with secret police torturing and killing perceived enemies of the state, Hasan said. "They come from a war-torn country," McKay said. "To think that you're not safe, still, after coming this far is scary." This week, hundreds of mourners stood in front of Alawadi's house in a quiet cul-de-sac nestled in the hills as the sun set, lighting candles for a vigil in her honor. Alawadi's mother arrived and her cries of sorrow pierced the air. Wails erupted around her as she walked through the crowd, sobbing and beating her chest. Some mourners wore the traditional black cloak and scarf worn by many devout Muslim women. Others wore T-shirts that said "Justice for Shaima Alawadi" above a silhouette of a woman wearing a Muslim headscarf. Kassim Alhimidi holds the body of his wife, Shaima Alawadi, during a memorial service at the Islamic Center of Lakeside, Calif., on Tuesday. She was buried Saturday in Iraq. Alawadi wore such a headscarf, and advocates for the Arab and Muslim community have suggested that her scarf may have been a factor in drawing attention to her as a perceived outsider, if indeed her killing was a hate crime. "We're not going to cry, if that's what you wanted. We're not going to take off our scarf, if that's what you wanted," Alawadi's eldest daughter, Fatima, said at the vigil, addressing her mother's killer. For many in El Cajon, the case has drawn parallels to that of Trayvon Martin, the unarmed black teenager shot in Florida last month by a Neighborhood Watch volunteer in a killing that has also drawn outrage because of its racial undertones. "My condolences go out to the family of Trayvon," Alawadi's 15-year-old son Muhammed said at the vigil, as tears welled up in his eyes. "My candle goes out to you as well." Some activists have begun linking the two cases on social media, spurring a popular #hoodiesandhijabs hashtag on Twitter. Martin was wearing a hoodie when he was killed. Students at several college campuses held "Hoodies and Hijabs" rallies on Thursday. On Friday night, while his father was in Iraq, Shaima's son Ali Alawadi stayed behind for a candlelight vigil with members of the Iraqi community at the Town Center Community Park in Santee, NBCSanDiego.com reported. "I just want to say thank you for honoring my mother," he said. "It means a lot. It gives us more confidence."